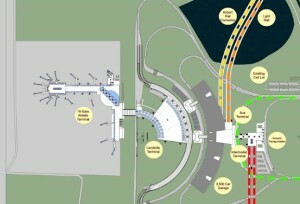 Beginning phase of planned expansion at Orlando International Airport (MCO). Late Friday afternoon, the Federal Aviation Administration announced approval of an economic development plan to build a new intermodal transportation center at the Orlando International Airport (MCO). This decision will allow the airport to collect new passenger revenues from this project to finance other future airport expansion. Without this FAA approval, there would be no future airport expansion. County and City leaders are planning a huge, billion dollar south terminal expansion and clearly this intermodal center is the backbone of their plan. This also explains why Orange County Mayor Teresa Jacobs was so supportive of the project and even mentioned it in her state of the county address. The intermodal center will also serve as All Aboard Florida’s Central Florida hub, linking Orlando to Miami by high-speed rail. More to come on the airport. One Response to "Just In: FAA Approval Launches Huge Orlando Airport Expansion"
So Governor Scott can approve $214 Million for ” business, tourism and commercial activity for decades to come.”, but not for health care for people with low incomes. I got it.